"Hylas! Hylas! Answer me, Hylas!" My nephew Hercules (Heracles) was frantic! Hours earlier we had beached the Argo at Mysia, exhausted and famished following the arduous rowing competition easily won by Herc (see Part I). Having snapped his oar at the end of the contest, Hercules went in search of a tree which would render him a new one. As the rest of us prepared our evening meal, handsome Hylas, Herc's best buddy and squire, set off to fetch fresh water. That was over two hours ago. Heracles had returned with an enormous fir, carrying it as if it were a twig, and as he was trimming it beside the camp fire, he asked where Hylas was. Told that a couple of hours ago Hylas had gone for water at the nearby pool of Pegae, but had yet to return, his worried pal immediately went to look for him. "Hylas! Hylas!" My nephew's voice boomed as he plunged frantically into the woods. He soon met Polyphemus, a fellow Argonaut, who reported that he had heard Hylas's distant cries for help and had rushed towards the voice. "But when I reached Pegae I found no signs of a struggle either with wild beasts or with other enemies. There was only his water pitcher lying abandoned by the pool side," said Polyphemus. Bummer. Herc hated when that happened. He had endured the loss of so many loved ones in his life and he was beside himself, fearing the worst about his beloved Hylas. Alas, his fear was well-grounded. Heracles would lose his buddy forever and we would lose the world's strongest man for the remainder of the Quest for the Golden Fleece. Woody, Woody, Woody: why didn't you say something? 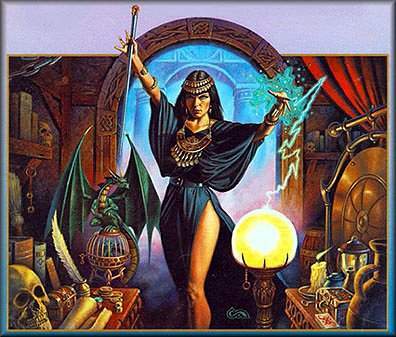 What sort of oracular branch are you, anyway? Dude, you should have warned us! "Hey, nobody asked me," replied Woody. No knock on Woody, but the Quest would have gone much smoother had Hercules stayed with us. But Herc's loyalty and love for his pal drove him and Polyphemus to continue searching all night, even forcing every Mysian whom they met to join in the hunt. But to no avail; Hylas had disappeared from the earth. Still, I wouldn't cry too many tears for Hylas. Here's what happened: Having arrived at Pegae, Hylas reached to dip his pitcher into the crystal-clear water. Instead he dropped it in astonishment as a maiden, more beautiful than any he had ever seen, emerged naked from the pool. It was the water-nymph Dryope, a creature too gorgeous for words. Now, you have to understand that Hylas himself was one good-looking Greek - arguably the most handsome hunk on the Quest, and that's saying a lot. One look at Hylas, and Dryope went dopey. "Stay with me," she breathlessly implored Hylas. "Live with me in our underwater grotto beneath Pegae!" Oh my...Mesmerized by her intense beauty, Hylas was torn between Dryope's enticing offer and his loyalty to Hercules and the Argonauts. What to do? What to do? What's a grotto? Dryope sensed his indecision and played her trump card - calling for re-enforcements, she summoned her sister-nymphs. They appeared out of the water, apparitions of pure beauty, each more achingly lovely than a mere mortal could bear. Hylas thought his heart would stop as they begged him to join them. I'm here to tell you that Hylas was no fool. 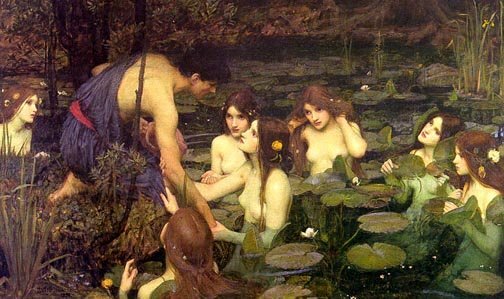 After being assured that indeed he wouldn't drown in their underwater grotto, Hylas pretended to cry out for help (that's what Polyphemus had heard) and plunged into the waters of Pegae, joining his harem of adoring water-nymphs. But poor Heracles didn't know about his pal's dippy move, and proceeded to search for him far and wide. Threatening to devastate the land of Mysia unless all inhabitants continued to search for Hylas, dead or alive, for weeks he sought his buddy. Finally admitting that it was all for naught, he took out his anger by leading a successful raid on mighty Troy, sacking and pillaging it. He then returned home to resume his Labors for that punk, King Eurystheus. A favorable breeze blew in at dawn and since neither Hercules nor Polyphemus appeared, Jason gave the order for the Argo to resume her voyage. Many of us protested this command, and we convinced Jay to delay an hour while the gang shouted out their names. Alas, the hillsides echoed with our voices, but our mates did not answer. We couldn't afford to wait any longer. 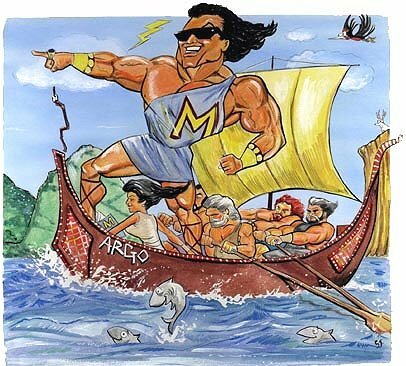 With heavy hearts we set off, but a terrible argument soon ensued - some Argonauts accused Jason of marooning Herc because he had beaten him in the rowing contest. They even attempted to have our navigator, Tiphys, turn the ship about. Just when I thought a mutiny was inevitable, Calais and Zetes jumped in and demanded that we keep going - that's why my nephew Heracles later killed them in the island of Tenos. Bad move, boys! Herodotus: "Heracles had been abandoned near Pegasae at the beginning of the trip when he went ashore to draw water. The oracular branch of the Argo claimed that he was too heavy to carry, so the Argonauts dumped him. I have it on good authority." Theocritus: "You old fogies are so dumb, you'd try to kill your fish by drowning it! Not only was Heracles on the Argo throughout the voyage, he in fact led the expedition. Read my book, damn it!" Homer: "Theo, I'm afraid your golden fleece is a fake. Go have it appraised, buddy, and you'll see that it won't withstand scrutiny. Fool's gold, I tell you. Heracles searched for Hylas high and low, then laid waste Troy before resuming his Labors. He never made it anywhere near Colchis." Apollodorus: "I'll go along with whomever buys the next round." The island of Bebrycos was our next port of call. Bebrycos was ruled by an oafish son of Poseidon named King Amycus, who wasn't very amicable. This arrogant king fancied himself a boxer without peer, and as a hobby would challenge strangers to a match. He never lost. That was the good news. The bad news was, anyone who declined to fight promptly would be tossed over a cliff into the sea. Hate when that happens. Now, there was a reason King Amycus (Mike to his friends) never lost - he was a hulking brute of a man, and "the muscles on his shaggy arms stood out like boulders covered with seaweed," according to Theocritus. When the Argo landed King Mike approached us, surrounded by his equally-oafish entourage. As always by his side was his half-brother, head-leech King Don, which means "Bad Hair" in ancient Greek. "Well, well, well, what have we got here!" smirked Amycus. "Looks like a bunch of pretty boys come to entertain us, King Don! Welcome, strangers! Which one of you's is gonna be the first to taste King Mike's famous knuckle sandwich? Don't be shy, I don't bite! Har, har!" I've got a sliver up my @#%!" your looks don't scare me! but I sting like a bee!" he said. All the Argonauts roared in appreciation, as Orpheus rang the bell to start the duel of death. I'll let the immortal Cosselus of Howardia narrate the fight, courtesy of Apollo Broadcasting Company (ABC). "It's a clash of Titans, folks, this Bathetic Battle of Bebrycos! In the home corner, wearing a nasty grimace and not much else, is King Amycos, tipping the scales at 480 pounds, with a record of 3,435-0. The Pythoness down at Delphi has declared Mike a prohibitive 40-1 favorite. "In the visitor's corner, representing the archegonos Argonauts fresh from the archipelago, is the Spartan Polydeuces, weighing in at 220 pounds, also undefeated and current Olympic gold medalist. We'll start the fight following these words from our sponsor." "This is strictly for the gold, sport fans, there is no argentiferous medal awarded! Second place wins squat! Polydeuces has strapped on the raw-hide gloves and is now facing Amycus. The king towers over the Argive Argonaut, no argument. What's this? Ladies and gentlemen I'm aghast, King Mike's gloves are studded with brazen spikes! One blow and the Spartan will be history! "Look at Polydeuces cautiously avoiding the dirty king's bull-like rushes! 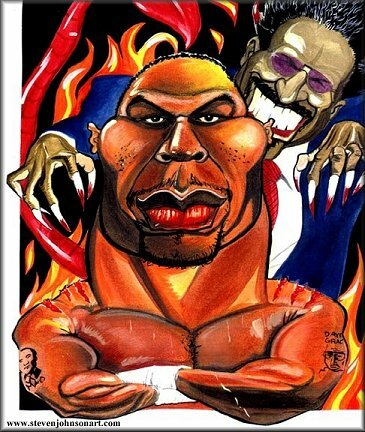 He is finding the weak points in Mike's defense and has him spitting blood from his swollen mouth! Neither shows signs of flagging, this is indeed the Bathetic Battle of Bebrycos! Oh, the Spartan has broken through Amycus's guard and has flattened his nose with a left-handed punch! Now he is dealing merciless punishment on either side of the king's face, raining hooks and jolts upon him! King Mike may have finally met his match! Good thing there's no ref, or this fight would be stopped! "I don't believe it! Mike has bitten off a piece of Poly's ear! Now in desperation, King Amycus has grasped Polydeuces's left fist and is tugging him forward, aiming a powerful right swing at his head. "What a great move by Poly! What a great move by Poly! Look at that little monkey go! He has thrown himself in the direction of the tug and the king's swing went wide. Now he counters with a stunning right-handed hook to the ear, followed by a furious upper cut so devastating that it breaks the bones of Amycus's temple and kills him instantly! "Folks, the next bell the king answers will be in Hades! It's a stunning upset, fans of pugilism! Ignoring the oracles' 40-1 odds for King Mike, Polydeuces has knocked off the king! Long live the new champion!" Here, Poseidon, these are for you. Sorry about your son, won't happen again...besides, he deserved it. Putting to sea the next day we arrived in Eastern Thrace, to the kingdom of Phineus. Now, in all of Greece there was not a more miserable and wretched creature than King Phineus, who was a mere shadow of a man - only his skin held his bones together. You see, Phineus long ago had been given by Apollo the gift of prophecy. But Phineus told the truth too unerringly, and this greatly displeased my godfather Zeus (see Zeus Part I), who'd prefer that his wife Hera didn't consult honest soothsayers. So Zeus caused Phineus to go blind. That was the good news. The bad news was, my godfather sent these frightful flying creatures with hooked beaks and claws, called Harpies, a.k.a. the Hounds of Zeus, to daily torment Phineus. Whenever he was about to dine the Harpies would swoop down from the sky and help themselves to the blind man's dinner, defiling the leftovers with their foul smell. Did I say smell? Try stench! Evidently the Harpies had a personal hygiene regimen rivaled only by the Lernean Hydra (see Hercules Part III). Once they were finished with the food, it was so foul and rancid that one couldn't be near it, let alone eat it. Poor Phineus, poster child for Ancient Anorexics Anonymous, was near death, and that's how we found him. Now Woody, the Argo's oracular beam, had told us that "all-seeing" Phineus would provide some crucial information regarding our voyage. By the same token, through his gift of prophecy Phineus knew that he would be defended against the Harpies by two men alone, and those two men were in our company - Calais and Zetes, sons of Boreas, the great North Wind. We promised to help and the king's servants set a feast for the king and the Argonauts. Immediately the Harpies darted down from the sky and in a moment had devoured just about everything, leaving behind their stench as a tip. Yuck! At once, all of us lost our appetites. Swords in hand, Calais and Zetes arose and gave chase to Ocypete and Aellopus, which were the proper names of the Harpies. The swift-flying sons of the North Wind caught up with the monsters and would have killed them had not Iris, Hera's messenger, intervened. Promising that the Harpies would never again trouble Phineus, the goddess of the rainbow Iris beseeched the sons of Boreas to spare their lives. "Forbear to kill the Hounds of Zeus," she said, "and by the waters of the river Styx I swear an unbreakable oath that Phineus will be cured of his Harpies." Cool. It's hard to say "no" to a rainbow...The boys returned with the good news and the grateful Phineus instructed Jason on navigating the perilous waters, particularly the Symplegades, these terrifying rocks which had an annoying habit of clashing together whenever anything passed between them. Hate when that happens! Whenever a vessel attempted to pass between them the mist-shrouded rocks drove together, crushing her. ("Similar to some women I've known," would sigh grandpa Hesiod, but we won't get into that...) But Phineus instructed us to first release a dove - if the bird made it through the Symplegades, then so would the Argo. If not, turn around and go home, it was hopeless. Man, could we use my nephew Herc right about now! Approaching the rocks we released the dove. We were ecstatic to see it fly through and come out safely, with only its tail feathers harmlessly torn away near the end. "Let's rock and roll, boys!" shouted Woody, and coming from an oracular branch, we took that as a good sign. We waited for the Symplegades to say "ah", then rowed furiously as swiftly as we could, our oars bent like bows. The rocks parted and we blasted through, with only the extreme end of our stern ornament shorn off as they snapped shut behind us. We turned to thumb our noses at the rocks, and saw that they had gotten lockjaw. Evermore they remained open and never again imperiled sailors. Woody thanked Athena aloud for nailing him to the prow, rather than the stern of the ship, and commented that we would have breezed through had Hercules been aboard. Resigned to the Quest minus Herc, and thankful that we had survived such a challenge without him, we resolutely continued our voyage. Next we touched at the small island of Thynias, where the great Apollo appeared before us in a blaze of divine glory. Inspired by the sight of his idol, Orpheus immediately raised an altar and sacrificed a wild goat to him as Apollo of the Dawn. The Argonauts cemented our unity by swearing at the altar never to desert one another in time of peril, an oath commemorated in the Temple of Harmonia that was later built on the island. It was a regular male bonding session, I tell ya, Atalanta included, and we all felt much closer to each other when we left Thynias. In fact, we felt downright invincible! Wouldn't you? Yeah, right. At the city of Mariandyne, which was to be made famous when Hercules would drag the mutt of Hades, Cerberus, up from the Underworld through a near-by chasm, we met with more heartbreak. We were warmly received by King Lycus, who was grateful to us for having vanquished his arch-enemy, the ex-boxer King Amycus. The good king was kind enough to offer us his son, Dascylus, as our guide along the coast. As we were about to embark, however, Idmon the seer was attacked and gored by a ferocious boar. I wanted to ask Idmon why he didn't foresee his own demise, but never got a chance, since he died from his wounds. Brave Idas impaled the boar before it caused any more damage, but it was far too late for poor Idmon. It got worse. Just like that, our navigator Typhis got sick and died. Hate when that happens! We placed him next to Idmon and mourned our homeboys for three days. 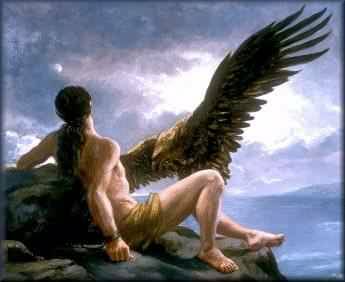 Many Argonauts offered to take the place of Typhis, but Ancaeus was chosen as navigator and he served us well. 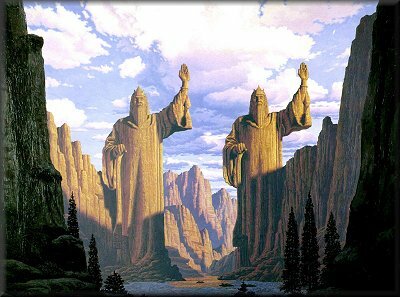 Let's see, we had lost Hylas, Hercules, Idmon and Typhis, and we hadn't even arrived at Colchis! Oh my. Woody, what's the deal? "Head for Sinope in Paphlagonia," Woody instructed us. Everyone had heard of Sinope - it was named after the river Asopus's daughter, with whom Zeus had fallen in love and promised anything she desired. "Anything, dearest Sinope! Just ask." "Ok, I want to forever keep my virginity." So Sinope made her home there and lived the remainder of her life in happy solitude. We landed and filled three of our vacant seats with some able youths, namely the brothers Deileon and Autolycus, not to mention Phlogius of Tricca, an old pal of Hercules, who had become stranded there and was overjoyed to see us. 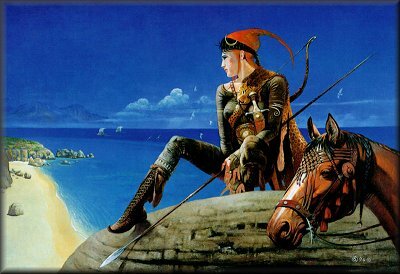 We sailed past the land of the Amazons, ferocious nation of warrior women who strangely enough were daughters of Harmonia, the sweetest and most peace-loving nymph ever. Weird. However, their old man was Ares, that war-monger, which explained their battling nature...the girls all took after dad, no doubt about that. Case in point - The Amazons would pinch off the right breast of every young female to better enable them to use the javelin and bow. Ouch! It appears they could hit the target easier without that annoying mammary interfering. Think these ladies meant business? Wisely they chose to keep the left breast so that they could suckle their young, seeing as they still tolerated men only long enough to keep their race alive. Half the Argonauts wanted to pause briefly and give the Amazons a fight they wouldn't soon forget, but that would have entailed much bloodshed on both sides, and we were on a mission, so we shouted out "Perhaps another time!" to the women warriors gathered on the shore, who were busy shooting us the one-finger salute. The Amazons seemed genuinely disappointed that we didn't stop for a tad. We stopped for nothing; Not for the iron-working Chalybians, who were the first people to live entirely on the gains of their forges, eschewing tilling the soil or tending flocks. Without pausing we sailed past the country of the Tibarenians, where by custom husbands groan, as if in childbirth, while their wives are in labor. Call it a shared experience. We stopped for nothing, not even to see for ourselves the land of the Moesynoechians, who, according to Apollonius Rhodius, "live in wooden castles, couple promiscuously, and carry immensely long spears and white shields in the shape of ivy-leaves." But near the islet of Ares we were bombarded by great flocks of birds which flew over the Argo, dropping brazen missiles, one of which wounded Oileus in the shoulder. Remembering the instructions of the oracle Phineus, whom we had saved from the pain of Harpies, we all donned our helmets and, while half of us rowed mightily, the rest protected our mates with our shields, clashing our swords and shouting at the top of our voices. Following Phineus's injunctions, we landed on the islet, driving away myriads of birds until not one was left to harm us. We had just finished setting up camp for the night when a terrific storm arose, smashing huge waves on our small island. Suddenly out of the cacophony and blackness of the storm we heard faint shouts for help. We ran to the shore and saw four figures clinging to a timber. The waves smashed their "raft" ashore and we raced to their assistance. The castaways turned out to be the brothers Argeus, Phrontis, Cytisorus and Melanion, sons of Phrixus by Chalciope, daughter of King Aeetes of Colchis. Hey, that's where we were headed! The four brothers were closely related to many Argonauts and we warmly greeted them. Man, were they happy to see us. Together we offered sacrifice to Ares at his temple on the island, founded by the Amazon Antiope. But when Jason informed the brothers that our mission was to bring back the ghost of Phrixus, along with their dead father's Golden Fleece, they had mixed emotions. Sure, they wanted to honor their father's memory, but they were reluctant to offend their grandfather by demanding the Fleece. And let's not forget about the insomniac dragon guarding it! Still, faced with a choice of remaining on Gilligan's Island or joining their cousins on the Argo, wisely they decided to side with us. Having thus filled the Argo's empty benches with the sons of Phrixus the next day we continued on. Colchis was near. With the Caucasus Range towering above us we entered the mouth of the wide river Phasis, which feeds into Colchis. Jason poured a cocktail of wine and honey and offered it to the gods of the land, that they may be merciful to us. We carefully concealed the worthy Argo in a secluded backwater and joined Jason in a war council. You see, all that had occurred to date was simply a prelude to the Big Dance. We had arrived at Colchis and Woody had warned us that King Aeetes would not easily part with his Fleece. Time to get serious. What's the plan, Jay?, inquiring Argonauts wanted to know. "Plan? I haven't a clue!" replied Jason, perhaps the last thing we wanted to hear. "But I say we march right in and demand the Fleece!" Cool. Let's go get it! Meanwhile, back at Mount Olympus, our patron goddesses Hera and Athena were anxiously keeping an eye out for their boys. Perhaps Jason didn't have a solid plan but they sure did. Knowing that the Golden Fleece could not be attained without the help of King Aeetes's daughter, they recruited my cousin Aphrodite to work her magic. Cousin Aphro instructed her naughty little boy Eros to let fly an arrow at the heart of beautiful Medea. The witch was bewitched by a passion for Jason and there were fireworks at Colchis.